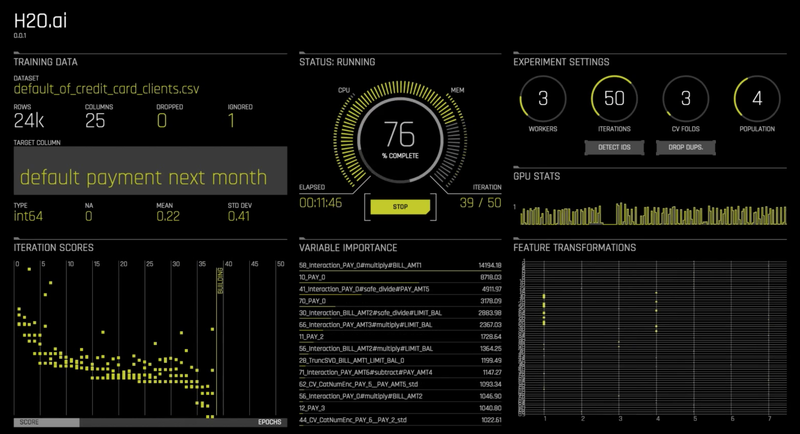 Driverless AI is the latest product from H2O.ai aimed at lowering the barrier to making data science work in a corporate context. The tool assists non-technical employees with preparing data, calibrating parameters and determining the optimal algorithms for tackling specific business problems with machine learning. At the research level, machine learning problems are complex and unpredictable — combining GANs and reinforcement learning in a never before seen use case takes finesse. But the reality is that a lot of corporates today use machine learning for relatively predictable problems — evaluating default rates with a support vector machine, for example. But even these relatively straightforward problems are tough for non-technical employees to wrap their heads around. Companies are increasingly working data science into non-traditional sales and HR processes, attempting to train their way to costly innovation. All of H2O.ai’s products help to make AI more accessible, but Driverless AI takes things a step further by physically automating many of the tough decisions that need to be made when preparing a model. Driverless AI automates feature engineering, the process by which key variables are selected to build a model. H2O built Driverless AI with popular use cases built-in, but it can’t solve every machine learning problem. Ideally it can find and tune enough standard models to automate at least part of the long tail. The company alluded to today’s release back in January when it launched Deep Water, a platform allowing its customers to take advantage of deep learning and GPUs. We’re still in the very early days of machine learning automation. Google CEO Sundar Pichai generated a lot of buzz at this year’s I/O conference when he provided details on the company’s efforts to create an AI tool that could automatically select the best model and characteristics to solve a machine learning problem with trial, error and a ton of compute. Driverless AI is an early step in the journey of democratizing and abstracting AI for non-technical users. You can download the tool and start experimenting here.